Desperately Seeking Adventure: Our Turkish Jeep Safari! My Turkish holiday this year has been one pure adventure, from my Istanbul trip to my shameless Hisarönü weekend, its been non-stop! Last Monday saw me embark on my eleventh or so Jeep Safari, a trip that I know very well! My advice, don't drink too much the night before but I won't ever be told anything different! Let's see if I saw any wild animals!? Ready, set, go! Leading our convoy of Jeeps we made our way out of Fethiye towards the smaller towns and villages of Mugla province, Turkey. Through my post drunk state I wasn't ready for the day but that was that! This full-packed trip doesn't stop for one second, well maybe for the ocassional rest stop every so often. Myself alongside my auntie Mandy, uncle Fudge and cousin Laura all watched the countryside change as we hurtled down the road at a high speed! Our first stop would be at Tlos, the site of a Greek ruin which was one a thriving community whilst Turkey's Greek population called this country home. Taking five minutes to marvel at the site and to be welcomed by our tour leader Semi, we had officially begun our Turkish Jeep Safari! We didn't have any time to loose as we were back in the jeep's and on the road again. I promised myself that I wasn't going on another Jeep Safari! Also watch out for the adorable children that stand on the side of the road to wet unsuspecting tourists as they pass in the jeeps, we were subjected to a series of soakings! My auntie Mandy took some boiled sweets along with us to throw to the village children as their eyes light up when they received a sweet from our passing jeep! Over the years I have learnt that holiday resorts stop abruptly when areas don't have amenities for tourists but forgetting that its always good to appreciate what we had as children for the Turkish village kids don't have much. It's not the typical Jeep Safari that one could experience out on the Serengeti National Park in Africa but I haven't been on a African safari so I can't compare. Like many holiday day trips its imperative to keep things simple, don't expect too much and then your day shall be just fine. Leaving the comfort of our villas behind us we set out on another Jeep Safari, oh I was in a state! 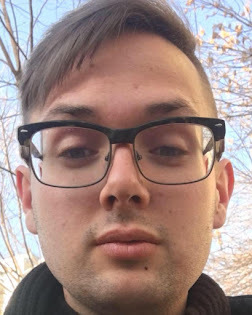 Leave your camera at the hotel! 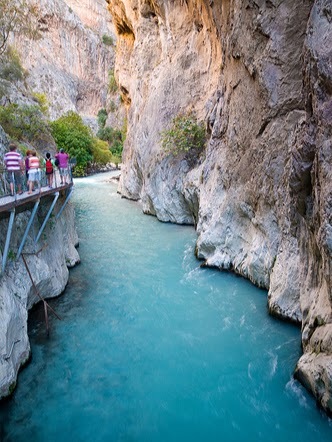 Moving ever closer to the Saklikent Gorge we made a short stop at Yakka Park, an oasis of calm at the foot of the mountains. We lazed in the Turkish seating areas, I did not plan to take a dip in the ice cold water! No! Our time at Yakka Park was short but really sweet, we enjoyed a chocolate Turkish pancake that was made by the village woman. We visited an alternative Yakka Park but I enjoyed the time equally. Subject to Turkish tourism law we visited a Turkish Carpet Factory, but having done this trip several times we opted to enjoy a cup of Turkish tea whilst everyone else saw what the fuss was about. I can go to IKEA to find a Turkish looking carpet but I don't think a gorgeous Aladdin would be included! Just my luck! Hangover, go away! At Saklikent Gorge we took our seats for dinner, a simple but fulfilling meal that consisted of two chicken skewers with rice and salad. Usually on past Jeep Safari's we would of make our way into the Gorge to marvel at its beauty and to dip our feet into the sub-zero freezing water, this time we lazed once again with the white water in our view, what's the deal with this mountain water? It's just too cold! I guess variety is the spice of life, it was nice to see the Saklikent area from a different point of view. One time before I lost my flip-flops in the gorge, I did not appreciate that! I opted to stay in the jeep for the short drive down to where we would meet the rest of the convoy! I think to myself know that it was a good idea deciding against rafting. No! On to the Mud Baths boo! It was time to get stuck in the mud! We were ready for our natural beauty treatment, our tour leader Semi said that we would look ten years younger after our appointment with the mud! During my time in the mud-baths I quickly established I had no chance getting my footing right, so it was a great splat in the mud for me! Overall it was a side-splittingly funny ten minutes or so in the mud, now we just had to wash this matter from our skin! Washing ourselves free of this quick setting mud proved to be a interesting exercise as the river we used had a very strong current! Nevertheless we completed our muddy challenge with little stress! Our drive from the mud-baths and onwards to our final location was simply breathtaking. We drove through Kumluova and the surrounding areas, where we were greeted with a wide array of beautiful views as we made our way closer to Patara Beach. I loved it B! Our Jeep Safari had come to an end, well not before a refreshing swim in the waters of Patara Beach. This beach has to be one of my favourites in Turkey, it just goes for miles and miles! I love this stop because it allows everyone to take some time to prepare for the drive back to Fethiye without having to rush. We enjoyed our time in the sea, got changed and had some food before returning to the jeeps for the final time that day. 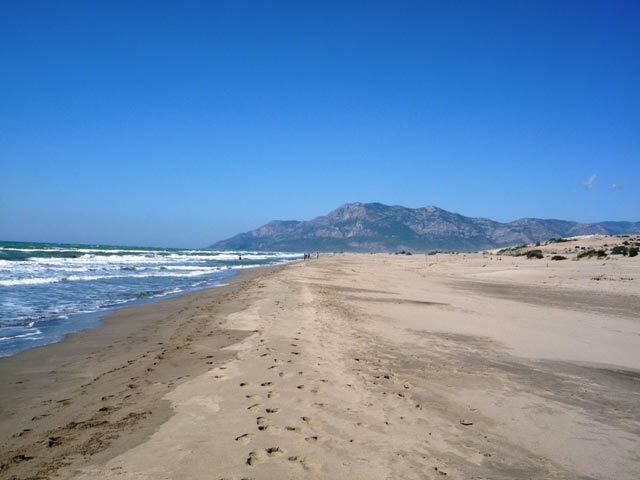 Patara Beach makes everything better, the jeep throws you about so a relax is much needed! I won't lie that over the years this trip has dragged a little because its an early start but for the final time it worked just fine! The drivers/guides work everyday through the tourist summer season, only having one day off a week at the most but they do a sterling job. We used Cadianda Tours and I would definitely use them again if I decided to embark on another Jeep Safari! 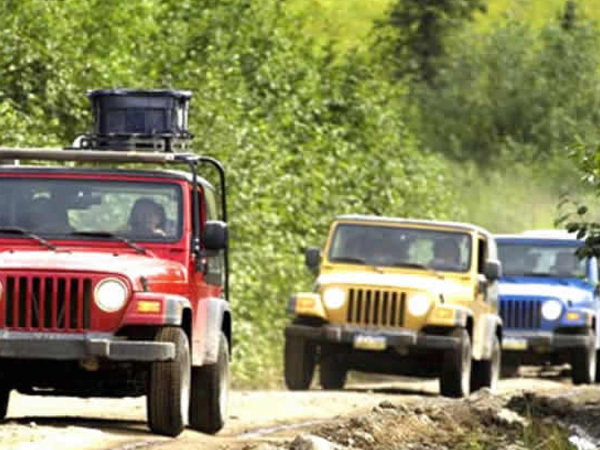 The Fethiye Jeep Safari is the best value for money trip in the area! That's done! Çalış Boat Trip... Set Sail Today!